The Handy Plan is a unique approach to weight loss and fitness. Each class is run by Steve Hoyles, a Personal Trainer in Stockport. Meeting every week at Life Leisure Houldsworth Village, the Handy Plan is the most successful weight loss group in Stockport. The methods have been refined over 10 years of study and practical application of weight loss techniques. The Handy Plan combines cutting edge dietary advice, specific exercise techniques and psychological support. The Handy Plan will change the way you view dieting, exercise and motivation for life! The methods taught are remarkably simple yet incredibly effective! Weight loss doesn’t need to be a lifelong battle – let us show you how you can change your life and health for good! Within two weeks you will feel better, within a month you will look better and after three months you will be a different person! 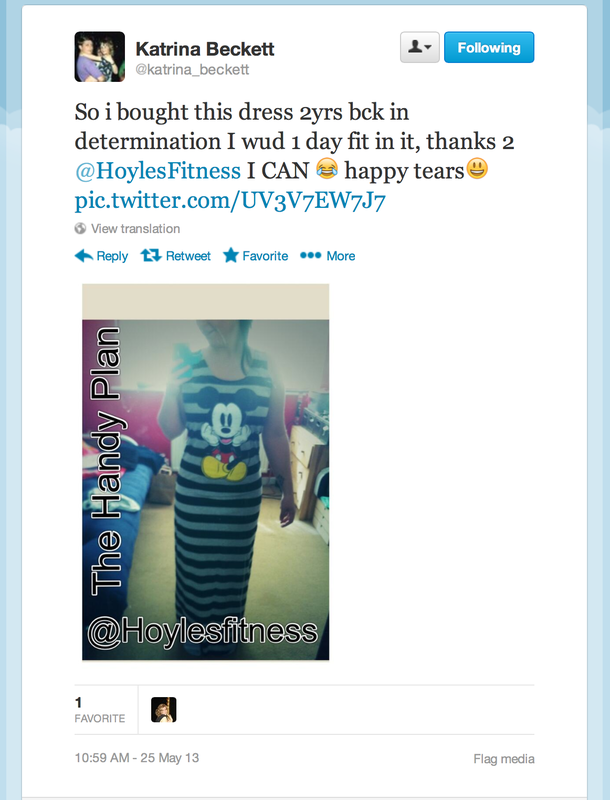 Full access to www.hoylesfitness.com members area content. Each session is fun, unique and friendly! We want to help you achieve the levels of health and fitness you deserve! The Handy Plan Diet and Wellness Club meets at Life Leisure Houldsworth Village, Reddish, Stockport, every thursday 6.45-7.45pm. Interested in losing weight and getting fit the Handy Plan way? Membership is only £24 per month. If you bring along a friend it is £20 each, saving you 20% simply by referring a friend! You don’t have to be a member of Life Leisure Houldsworth Village – the Handy Plan is a Hoyles Fitness business so memberships are not linked. Joining in April 2012 I was completely unfit, overweight and generally not feeling great. After the first session I was very encouraged because everything I needed seemed to be on offer, dietary information which was a new revelation and I learnt so much about how the body works it is so amazing, Steve has a way of teaching which is very easy to understand and leaves you wanting to know more. As for Vinny he will change the shape of your body, you become stronger and fitter. All in all the Handy Plan club offers everything you need to live a healthy lifestyle. I have reached every goal that was set right at the beginning after 6 months I lost 25 pounds, and I just love to workout 3 or 4 times a week I feel so healthy and strong. The Handy Plan club is a fun place to be to meet new friends and become that person you have always wanted to be. Thank yo so much Steve and Vinny for your vision and encouragement. The Handy Plan has been completely life changing for me. I have always trained in a gym but have never really been what you would call ‘in shape’. I have tried lots of diets in the past, all of which worked at first but failed in the long run. The Handy Plan on the other hand has not just been another diet – it has been a complete lifestyle change. By changing just a few aspects of my diet and following a structured training programme I have achieved amazing results! In just 3 months I have lost 42lbs and managed to reduce my body fat by 11%. Losing the weight has really given me confidence boost, I’m taking pride in the way I look and in the clothes I am wearing. The Handy Plan is really simple to follow and has been a really positive lifestyle change for me. I would definitely recommend it to everybody! After giving birth to my son, I carried about 2 stones of ‘baby weight’ that I wanted to lose. I needed a simple plan that didn’t require complicated weighing of foods or points counting – I was a busy new Mum and didn’t have the time or energy for anything too complicated! The Handy Plan has been fantastic – I saw results very quickly, the diet is so easy to follow and the exercise plans improved my fitness really quickly! I lost my baby weight within 8 weeks and have kept it off! At the age of 50 and weighing in excess of 16 stone, a chance meeting with Steve Hoyles gave me a life changing opportunity to lose weight and regain my fitness. I was impressed by Steve’s expertise and enthusiasm in his subject, and as a result I followed his advice to the letter. Within a year I managed to lose four stone, and to reduce my body fat from 33% to under 15%. This was done through a combination of exercise and the Handy Plan diet. Following the Handy Plan has totally transformed my health and fitness and the way I think. For more information on the Handy Plan, contact me, Steve Hoyles on Steve@Hoylesfitness.com or 07866361964.